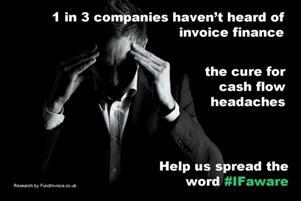 Support is already growing for our #IFaware invoice finance awareness campaign. This is our newly launched initiative to make some small effort to tackle the issue of only 2 out of 3 companies knowing what invoice finance is. However, there is a huge way still to go so we need more people to share this message if we are going to raise awareness levels amongst the 32% that have never heard of invoice financing. Clearly there are a lot more invoice finance companies, brokers, intermediaries, and users of these services, that could help spread this message further. If you are not on the list, please get involved. Any support would by most gratefully received. You can help by sharing the graphic as widely as possible via your site, blog, social media or other channels. You can find all you need to know about sharing the graphic shown above, including links to access it on social media, here: Instructions about how to help. Feel free to comment on this post if you have helped spread the message, or if you have any other suggestions on how we can raise awareness of invoice finance. "Thanks Skipton Business Finance for adding your support via the Invoice Finance Research Group - much appreciated."